Andrew Bogut is starting to show signs of tension. 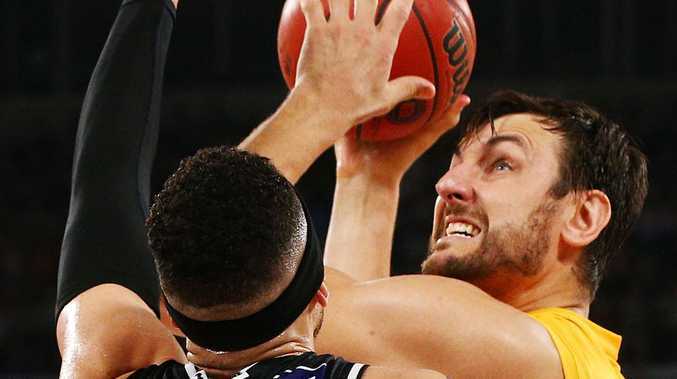 ANDREW Bogut is frustrated and misfiring Sydney Kings import David Wear isn't helping the situation, according to Mark Worthington. The 335-game NBL veteran, who began his career in Sydney and is now a league commentator, sat behind the Kings bench during their Monday night loss in Melbourne. The 77-70 result saw Andrew Gaze's much-hyped side fall to a middling 3-3 this season but what Worthington saw painted a far grimmer picture. "Bogut's visual frustration at some people's lack of defensive effort; I'm not sure how much more he can stand," he said. "There is a frustration and it will come to a tipping point at some stage ... it's top to bottom because management are frustrated too. "They do have one of the greatest line-ups assembled and they're not getting the rewards." Worthington said Gaze would be feeling the heat but that former NBA forward Wear looked to be in more immediate danger. 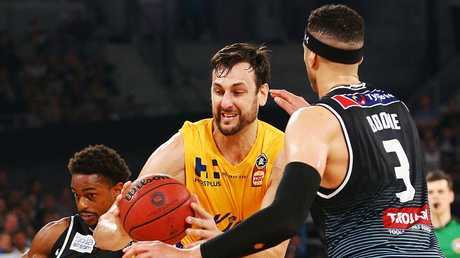 The 28-year-old has averaged just seven points and four rebounds in his first NBL season, shooting at 37 per cent. He played just 13 minutes on Monday. 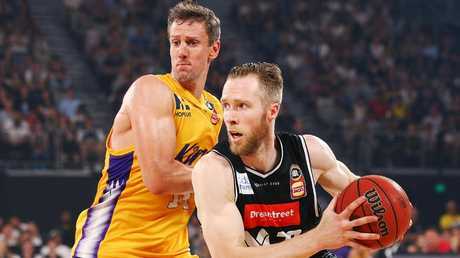 He has so far started ahead of proven Australian Daniel Kickert, who has 13 points per game on 53 per cent shooting and played 27 minutes in the loss to United. "He doesn't fit what they need; he's essentially a poor man's Daniel Kickert, who's still playing great basketball," Worthington said. "He's frustrated, the Kings are frustrated, so I'm not sure how much longer that's going to stick. "By all reports he's a great guy, acts like a pro, but you can just see the tension building amongst the players. "Every time he makes a shot you can see the sigh of relief." Worthington thinks a more explosive and athletic import would complement the Kings' perimeter threats and help Bogut on the boards, where they were exposed by United. The dual Olympian would also like to see the Kings use Bogut's passing and interior game more often to add another offensive layer when the shots aren't dropping. "They need an injection of some sort of spark," Worthington said. "Because I saw more intensity out of them in the pre-season than what I saw (against United). "The Kings playing well is good for basketball in Australia and when they're going they're an exciting team to watch ... we just want to see that every week, not every now and then."